While the Italian Senate was discussing the Venezuelan issue in Rome, 500 metres from the Italian Senate on Piazza Vidoni there were protests in support of Venezuelan President Nicolas Maduro, and "against the US attempt to unleash a war using their puppet Guaido". Sputnik discussed what was behind the demonstration with one of its organisers, Marinella Correggia, an activist with the NGO No War who works as a journalist for the communist Italian newspaper Il Manifesto. Sputnik: Marinella, what is the message behind this demonstration? Marinella Correggia: Various public organizations are taking part in today's (Tuesday's) protest, that's being held right next to the Senate. Members of these organisations sympathise with the people of Venezuela and oppose the war. We're asking Italy and Europe to stop dancing to the tune of the United States, which threatens Venezuela with invasion, imposes sanctions and organises a coup d'état through intermediaries. 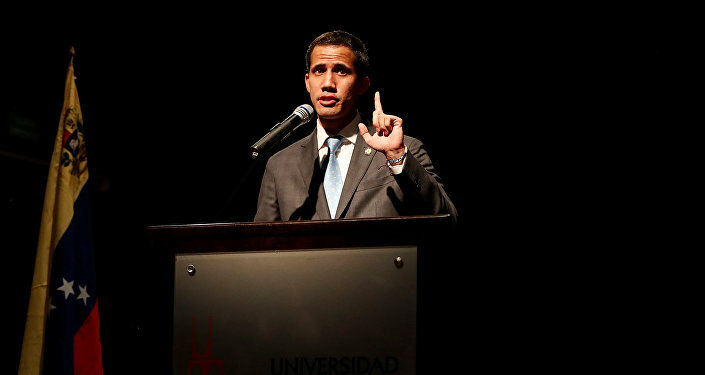 In order not to follow the American course, Europe must refuse to recognise (which has more weight than simply not recognize) Guaido, who is a puppet controlled by the United States. Until recently, nobody even knew him in Venezuela. He became famous in 2017, during the cruel guarimbas protests, and how did he gain popularity? His party, Voluntad popular, showed naked bums to the police and threw feces at them. Is this a person that can be trusted with the country? 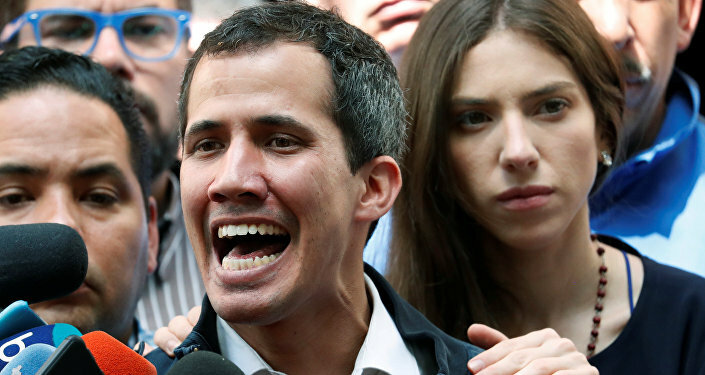 For us from No War, even the position of Italy, which has not yet recognised Guaido, is weak, because it implies a neutral attitude to both the leader of the coup (an extreme right one) Guaido and to Maduro, who is the legitimately elected president. The Maduro government sits at the UN, and it is recognised by most countries in the world, but not by Italy or the European mega-powers. We consider it absurd that the West and its allies in Latin America (the Lima group consists of countries with rather questionable democracies) demand new elections in order to continue negotiations. We want to remind of the previous instances where the West has recognised 'provisional governments', which later turned out to be none other than terrorist groups through which NATO and the Gulf countries were earning money. Don't Libya and Syria and what has been going on there since 2011 tell anyone anything? And now these countries have formed alliances with absurd names like "Friends of Syria" or "Friends of Libya" and are fuelling conflicts in the regions, leading to horrific consequences for which no one will ever be held responsible. Sputnik: What do you expect from the EU and the Italian government, which on Monday received a delegation from Guaido? Marinella Correggia: Unfortunately, we expect very little! It is no coincidence that today's (12 February) demonstration is taking place not far from the Senate, but we were not given permission to protest in front of the building. At the moment, Italian Foreign Minister Enzo Moavero Milanesi is speaking in the Senate. But the position of this minister, like the whole League (Party), on the issue of Venezuela is terrible. At least the Italian government said "no" to the recognition of Guaido by the EU; instead, it took a neutral position, which for us, I repeat, is absurd, Maduro is the legitimately elected president). The foreign minister and the League are in favour of Guaido, and we fear that they may have a bad influence on the official Italian position. Yesterday (Monday, 11 Februrary), Deputy Prime Minister Salvini and Minister of Foreign Affairs Moavero received a delegation sent by Guaido. One of its representatives, among other things, was Antonio Ledezma, whose biography is full of criminal activities! In 1992, as governor, Ledezma violently suppressed protests. In 2002, he was a member of the coup against Hugo Chávez, in 2004 he tried to do it again. In 2014, he took part in the attempted coup of La Salida, which led to the deaths of many people. It is for this reason that we send a letter of protest to Foreign Affairs Minister Moavero. Sputnik: What do you think about Maduro's refusal to accept aid from the United States? Marinella Correggia: "Humanitarian" aid from the US is NOT humanitarian aid, this was confirmed by the Red Cross. This assistance is not neutral, in fact it is just an excuse to bring in the soldiers, or mercenaries, of other countries into Venezuela. Let's recall that in Syria, the West, on the one hand, supported terrorists financially, politically, and militarily; and on the other hand, demanded humanitarian corridors. Do we want another "humanitarian war", just 20 years after a similar one between NATO and Yugoslavia? This is called a humanitarian war. Then it will turn out that while they offer help, they also impose sanctions. Sanctions against Venezuela, which are estimated to have caused $20 billion in damage. The $20 billion "help"! Sputnik: How do you think this conflict can be resolved? Marinella Correggia: The mobilisation of the international community is what is needed and that was missing during the Libyan and Syrian tragedies. Now it seems that the world community is responding faster. As a pacifist, I believe that to oppose the economic war in Venezuela is a moral duty: under Chávez and after, Venezuela was a member of the Axis of Peace, opposed the Western wars, especially in recent years. On numerous occasions at UN meetings, Venezuela was pretty much the only country that bravely opposed aggression.